God bless parent volunteers! I love to see parents that care so much about their kids’ education. This is also the story of why I am so grateful that my husband took time out of his crazy web design business to build me a happy little author site. If he hadn’t, I never would have met Staci Harrold. Staci, a mother of two from Pennsylvania, emailed me at the beginning of the year to ask if I would visit her daughter’s school. She did a Google search for “author visit” and found my ad. I guess she liked my website because she had never heard of me before. Staci did a great job organizing everything, and we worked out a half day schedule for this morning. Well, I flew in to Pittsburgh last night , and had no more dumped my bags in my hotel when two third grade teachers, Ms. Brody and Mrs. James (and the entertaining Mr. James!) arrived to take me to the Monterey Bay Fish Grotto for dinner. I have to say that a gorgeous view of the Pittsburgh skyline, and the three rivers, not to mention the delicious macadamia-encrusted mahi mahi, is a pretty great way to start out a school visit trip. After dinner, I settled down in my room to autograph the books. Today, I gave 2 presentations at Gill Hall Elementary. First I spoke with the primary students, and then the upper elementary. In between the two presentations, I had a chance to visit with David Pribish from the Mon Valley Education Consortium. Staci Harrold applied for, and received a grant from this amazing organization which payed for my visit and a set of my books for each classroom. It was great to connect with David so he could see how his grant was put into action. I love to see schools receiving this kind of support. After the talks, I toured the school to give award certificates to each classroom for their amazing door decorations. 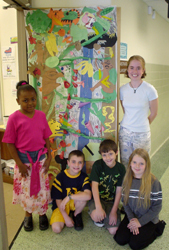 This is a picture of me with Ms. Brody’s third graders and their remarkable rainforest door. Next, the teachers & parents provided a catered lunch in the art room. Thank you Gill Hall School! Go Jaguars! P.S. On the way to the airport, Staci told me that she was inspired to bring an author to Gill Hall because an author visited her school when she was in second grade. Just the kind of encouragement I needed! Hello from Iowa! I spent the day at Grant Wood School in Cedar Rapids today, where I got to speak with some wonderful students. My husband Gabriel drove up with me (it’s about five and a half hours from St. Louis) because we plan to visit the new National Mississippi River Museum & Aquarium in the Port of Dubuque, Iowa on our way home tomorrow. It’s great to have company on these author adventures! Well, our hotel room was very nice, but we didn’t see very much of it because we arrived in Cedar Rapids at about 2:00am last night. This morning, we arrived at Grant Wood School at 8:00am and were greeted by teachers and staff, and a delicious buffet breakfast. A fabulous way to start the day. Next I signed some books, and then met with two groups of students who had made their own books for a contest. It’s an interesting idea – making a book as a team. One team of 3 girls made a book about what it means to be a good friend to someone, and the other team of 3 boys make a book about Cub Scout Pinewood Derby races. I spoke with the 4th and 5th graders before lunch, which was a tasty buffet of homecooked dishes catered by Barb Fulton. In the middle of lunch, some students even popped in to perform the Grant Wood Griffons cheer at the top of their lungs! In the afternoon, I visited with 1st, 2nd, and 3rd graders. 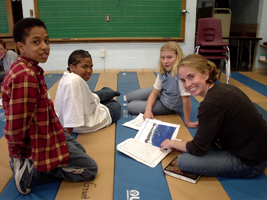 This is a picture of me talking with some 5th graders who made a journal book for a class assignment. I love it! All these kids practicing their writing, illustration, AND their cooperating skills by making books together! The teachers were very generous and gave me lots of Grant Wood Griffons swag – I felt like I had just joined NPR or PBS! (…and at the $40 level, we have this lovely mug…) Mr. Hosford, the Media Specialist, even gave me a framed painting of an orchid he did himself! I was also given a copy of the ABC book “H is for Hawkeye: An Iowa Alphabet” which was autographed by all the Grant Wood teachers. Wonderful — I have the Michigan and Missouri alphabets in that series already. At the end of the day, Mr. Hosford invited Gabriel and me to go hot air ballooning with him, but we were so tired that we went back to our hotel and slept until 8:30pm. It was a nice offer, though. Thank you Grant Wood Griffons! Today I had the opportunity to speak with a whole school full of 4th graders! I visited Harris Elementary in Amherst, Ohio as part of their Right to Read Week. 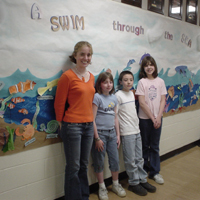 This is a picture of me with some students who helped make gorgeous ocean and rainforest murals in preparation for my visit. I was thrilled with the intelligent questions that the students asked, and how well they sat and listened. Keep up the good work. Thanks to Mrs. Gambish for her wonderful hospitality – and all the teachers for their hard work to make this day happen. Thank you Harris Elementary! We’re having a beautiful spring here in the Midwest! The forsythias, cherries, and magnolias have already blossomed, and now the red buds are bursting out everywhere. How fitting that I got to spend the morning driving an hour through sunlit farmland to Red Bud, Illinois to speak at a young author conference! 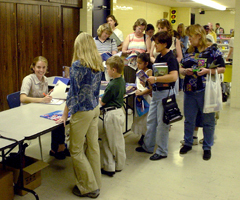 I gave a 30 minute talk to students and parents, autographed books and answered questions. I was thrilled to see so many parents resist the temptation to work in their yards and support their children instead. Every one of the approximately 150 students at the conference made a book, which they proudly showed off to the parents. Congratulations to all the young authors!